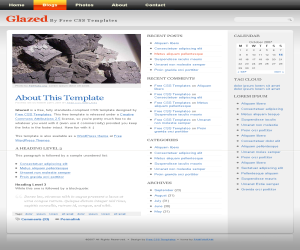 Another free templates for you and original design by freecsstemplates called Glazed template was successful converted in to blogspot theme, and this template is also available as a WordPress theme at Free WordPress Themes. Glazed template is free template with reflection design and if you looking for a stylish template the answer is Glazed Template! Of course and yo can freely download this template, but please don't remove the credit because we have spend so many time to make this template and we gave you free, nothing else just please don't remove credit link. eeemm buat blogger ya, kalao buat wepe? ditunggu kunjungan balik dan komentarnya terutama dalam tulisan manjakan mata, telinga dan waktu anda dengan samsung LED TV. * Display personal information or day today activities as in a blog. * Display a extra gallery of templates. * Place music files such as mp3 on line for play through a web browser. * To setup a private login area on-line. anjriiiiiiiiit ada rani juliani nyasar kesini euy..
templetnya bagus bos, simple gitu loch..
templatenya keren nih sob.. ga kayak blogger, tapi jadi mirip Wordpress.. hehe.. sip2..
manis tenan templet nya bos..
Templatenya soft yah. Bagus, nggak kasar tampilannya. Wah bisa didownload neh. Thank's bro. Your blog is really cool! I will wait when you finish. Thank you for interesting articles.